Making a Conoid style chair. This is one of my interpretations of his iconic style. 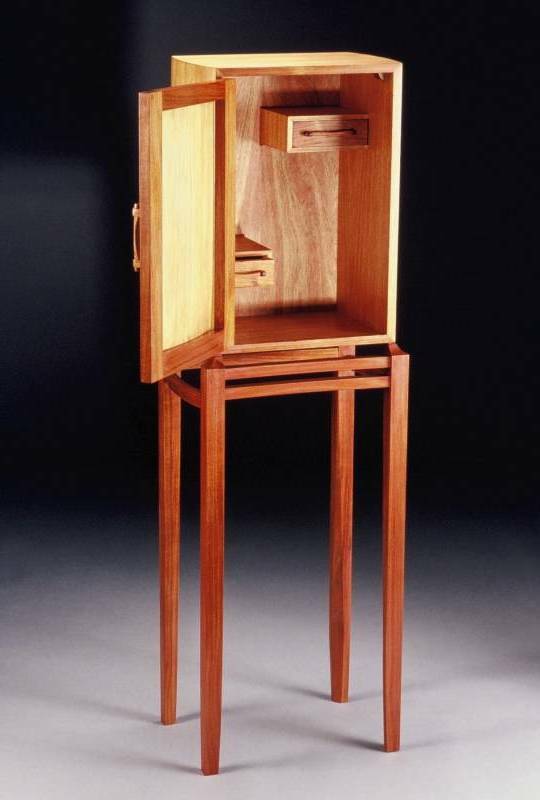 James Krenov is revered by many craftsmen for his inspiration to bring into one’s work simplicity, harmony and above all, a love of wood. Krenov’s books, A Cabinetmaker’s Notebook and The Impractical Cabinetmaker shun ostentatious and overly sculpted pieces, stains, sanded surfaces, and unbalanced or un-proportional constructions. 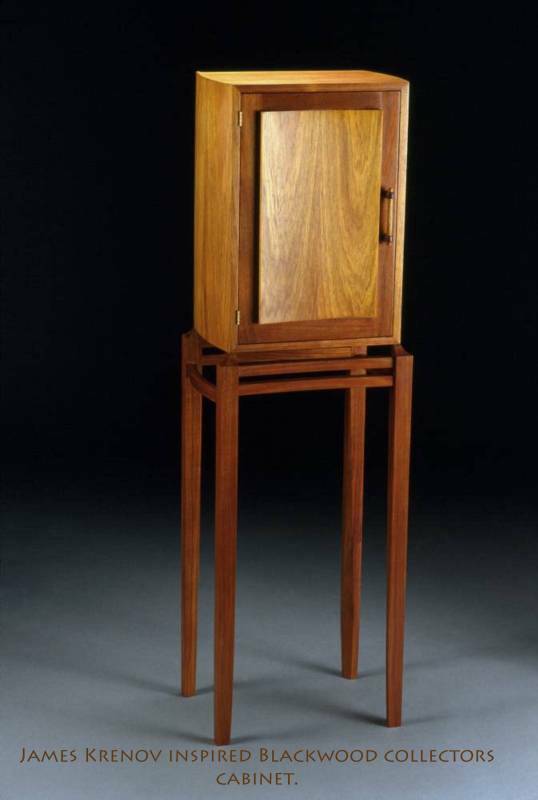 Krenov felt that details such as uniformly rounded edges, perfectly flat surfaces, and sharp corners remove the personal touch from a piece of furniture. Some years back when I read the above books, it changed the way I approach the craft. 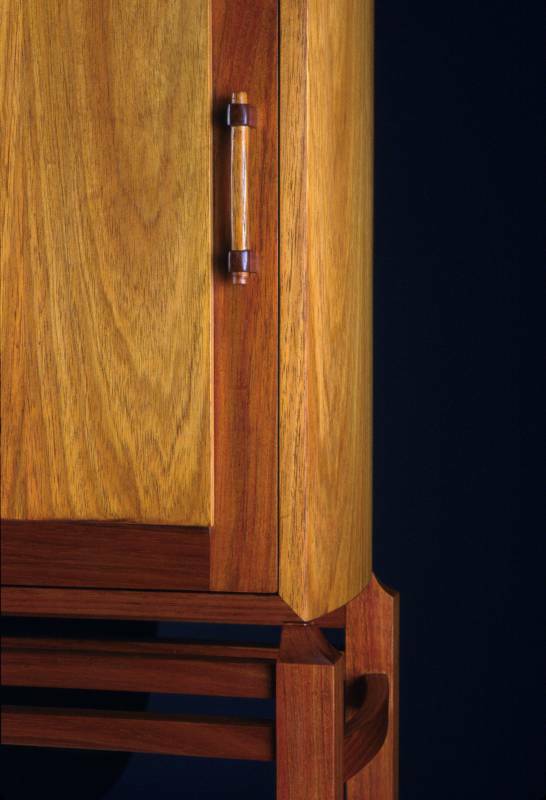 At some stage of most woodworkers lives, they all love to have a go at creating their own Krenov inspired cabinet. This is one of my first Krenov inspired cabinets. A combination of solid and veneered Blackwood. I have never been a fan of different timbers that vary to greatly in colour, so in this instance I have only used Blackwood, but varying in colour and hue to create a visually simple but balanced look. 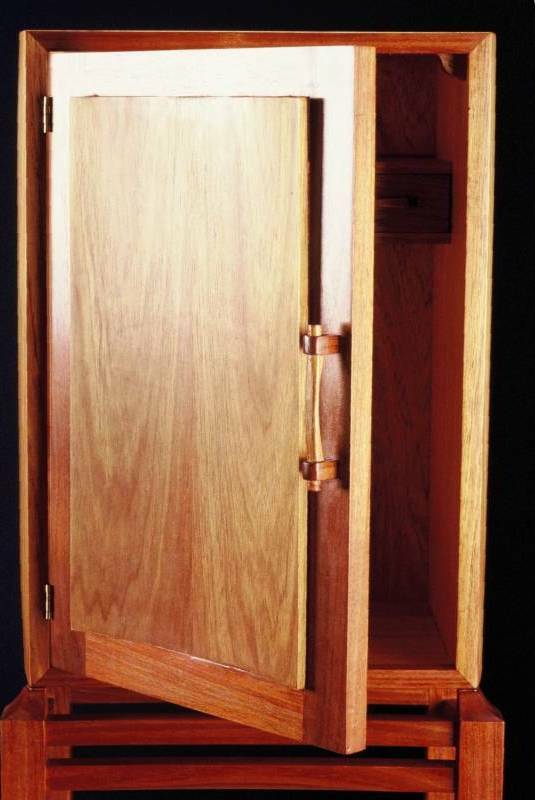 The case work is a veneered convex torsion box, the door panel is concave, pinned only in the middle of the flat frame rails that allow you to see into the cabinet through the sides. It’s a Krenov idea that l ooks sensational. The base is solid, and side rails are laminated convex curves the same radius as side of cabinet. The inside corner of each leg is chamfered lightly at the top, leading to a more heavy chamfer at the bottom, turning a four sided leg at the top into five sided at the base… very effective. Sadly, Krenov died in Fort Bragg, California on September 9, 2009. He was 88 years old.